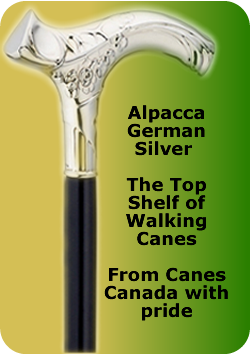 7634-00 The Chrome Plated Embossed Fritz - This cane is for those looking for more than just a cane. This fashion statement is chrome plated on hard plastic and attached to a shiny black hardwood shaft and finished off with a decorative chrome ring. Because metal handles will take on the weather around them, people with arthritis may find walking with them uncomfortable. 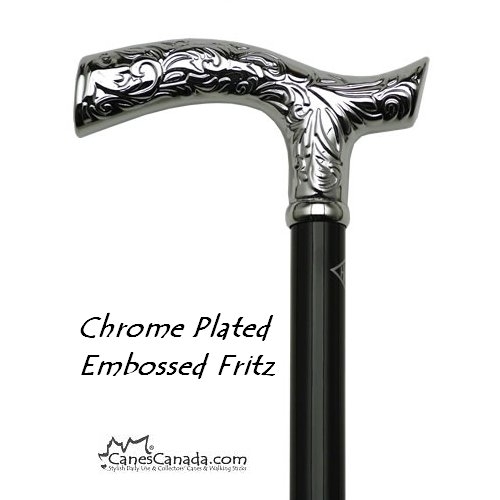 A cane made from a hard plastic makes using a dressy cane like the Chrome Plated Embossed Fritz cane possible. 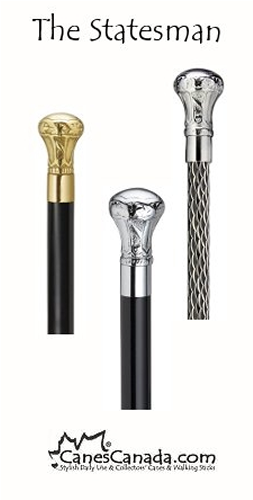 Metal handles are sometimes too heavy, vs the lighter plastic core handle, so for some people, this is a very important feature to consider before buying a cane. Length - approx 36 3/4"